That’s right, this month will be about celebrating other amazing bloggers. We plan on highlighting some of the amazing recipes we found during last years MOFO as well as recipes we stumble upon last year. If you have a recipe you would like us to share, send us a link to dontfearthevegan@yahoo.com. Make sure to check out the blogroll on the Vegan Mofo page to see all the other amazing bloggers participating! For the last few months I have been participating in a Vegan Food Swap hosted by Cat at The Verdant Life. It has been really exciting to get the package in the mail each month and try new things. Hubby and the little vegan have been just a giddy as me. What better way to start our Ode to Vegan Bloggers than to share the stash I received from Maureen at Magnolia Beginnings. 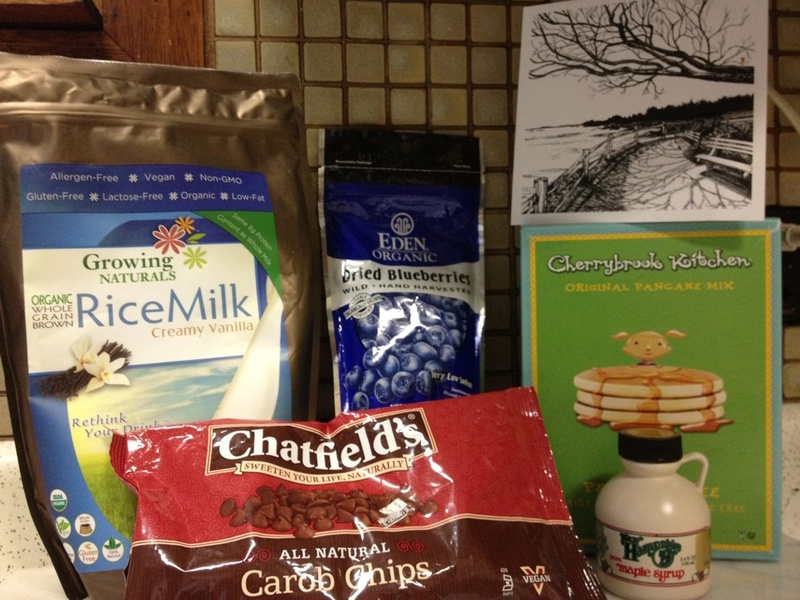 We received all the makings for carob, blueberry pancakes. What an awesome idea! I never thought of sending a theme box. Some of the items I have never tried and am looking forward to are the powdered rice milk (what a great thing to keep in the cupboard) and the blueberries ( I will get a pic of those once we open them up.) Thanks for everything Maureen!! Hubby is the pancake maker in the house so he volunteered to make the pancakes this morning so we would also have a picture of the finished product. Unfortunately, though we love our old house, it often has issues at the most inconvenient times. Today it got grumpy and decided that the plumbing in the kitchen would go haywire, a problem we had worked on a month ago. Ugh! Well the call is out to the plumber and we will attempt to have the pancakes tomorrow at which time I will add the picture. Does the swap sound like something fun you would like to participate in? You don’t have to be a blogger and you will learn about new great food items! Check out the info here to learn more. Also check out the links below to see the best things I received. I love your idea for Vegan Mofo! Missed out on the swap last moth but hoping to join this month. Looks like a great box. Thanks! There are so many great bloggers that deserve recognitions! I love, love, love the idea of a vegan food swap and I just signed up 🙂 Thanks for posting the information. How exciting! Maybe we will swap one day!